Some people think that persistent contrails (high altitude aircraft vapor trails) are unusual, and are evidence of some secret government plot to modify the weather, or spread some population controlling drug or toxin. This is based on a misunderstanding of how contrails form, persist and spread. It is also not a new misunderstanding. Back in the 50’s in America, contrails were a fairly rare sight in many parts of the country. Air travel was a fraction of what it is now, commercial jet travel did not start until 1958, and military operations were generally limited to particular areas. So it was not surprising that when someone noticed a contrail for the first time, they might think it to be unusual. Mystery Veils Vapor Wreath in Gaveston’s Sunny SkiesIt wasn’t a sky-written soft-drink ad and the weatherman couldn’t offer an explanation either for the fat white streaks of vapor hanging motionless in Galveston skies around noon Saturday. But it seems fairly certain that a six-engined B-36 left the heavy white trail in its wake as it circled over the city. Neither municipal airport nor civil aeronautics authority official had a flight plan on the bomber. Both outfits however, believed that the jet-powered B-36 was on a training mission from Carswell Air Force Base in Fort Worth. An Air Force spokesman at Carswell Base refused to comment on either the bomber or its “vapor trail” when contacted late Saturday by The News. 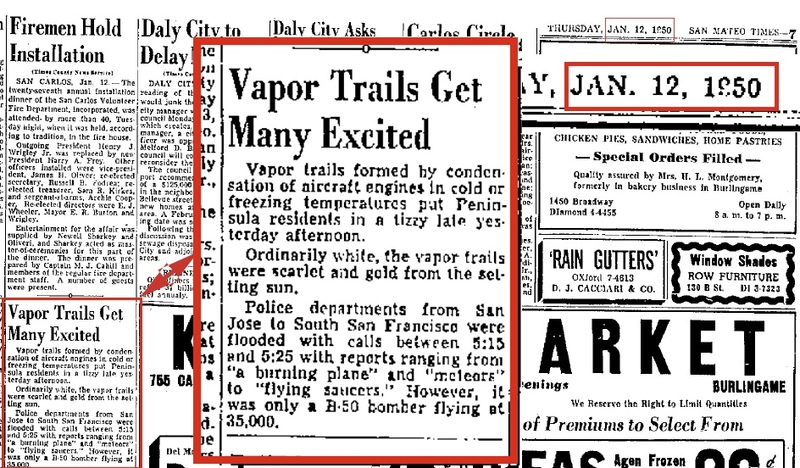 Mystery of the massive vapor streaks was their long steady persistence in breeze-stirred skies rather than their expulsion from the jet-powered plane. Airport officials commented that a vapor trail usually fades away swiftly, as in sky-writing. They also said that planes may leave vapor trails when flying at high altitudes. But it was unlikely, they added, that the air would remain still enough to keep the vapor from fading swiftly. Another odd thing – onlookers said the bomber engines rather than the jet exhausts were pushing out the vapor clouds. The only thing certain about the vapor mystery seems to be that the B-36 was flying at altitudes between 10,000 and 25,000 feet when it circled Galverston. There are several components of the misunderstanding. Winds at altitude differ significantly from winds on the ground. Sky-writing happens at a much lower altitude and is totally different. The B-36 was the largest American bomber EVER, 50% larger than the B-52, and could easily cruise at 40,000 feet. So estimates of its height over Galverston could easily be underestimated, if based on experience with more typical aircraft. The B-36 also did not use its jet engines at cruising altitude, only for takeoff and dash attacks. All the trails are from the same B-36 jet overflying the test site (it was an aerial test). And here is an account of a B-36 leaving persistent contrails at 20,000 feet. “Their out to poison us all!” version. I have spent much time since then watching the skies and have come to my own conclusion. 1. Contrails are normal. The weather and engine dynamics determine their formation. 2.A massive cloud seeding and cloud spraying operation are happening as well. They have fine tuned their methods over the last several years so that no more green and lavender clouds appear. I do not believe it is sinister. By creating cloud cover the effects of global warming are mitigated in the treated areas. Here is an old newspaper clip dating back to 1920. The exhaust gas from the airplane freezing in the frigid temperature, caused a cloudlike formation, resembling the tail of a comet, to hang below the clouds. Sounds like it was a fairly short contrail. Still, something they had never seen before. It was a clear blue sky early this morning, I always thought contrails were a far stretched conspiracy theory, A friend said looking up. “I hate contrails” As I looked up, I thought what? And to my surprise their was about a dozen crossing trails across an otherwise beautiful blue sky. Living in this town all my life I realized two things, One was that this was unusual because usually their is only one or two planes in the sky at any given moment, ( I frequently look at the sky in the morning watching the sun rise, and during hunting season). And secondly I realized I had never seen this before. About a dozen criss crossing thin contrails across the sky. My friend then told me that unlike normal trails they would stay suspended in the sky and slowly spread, Sure enough, they have. its about 10:30 am and we have an overcast sky one would think to be an ordinary day. No blue sky in sight. Strange only because I know from watching this develop, that its all man made, and somehow it was supposed to be a bright clear day with a blue sky and no clouds in sight, I now have three theories to why this was done, As one will realize it was purposely done if watching it from the early get go. as planes criss cross the sky until no sky is seen. Two of my theories are not pleasant and can be found with most conspiracy sites on-line, The third idea is more reassuring, however I keep it off the net due to national security. The point isn’t to create a widespread conspiracy, but to debunk those who say it is just natural air traffic. simply observe it some morning from the beginning to the end is all that’s needed. sarxs, why do you think you never noticed this before this morning? If you never noticed it before, how do you know when it started? I’m not sure why you think it’s not natural air traffic. Could you be more specific? Not weather modification: cloud seeding. Weather modification would not be done in the stratosphere because there are no rainclouds there – of any sort. A massive cloud seeding and cloud spraying operation are happening as well. Persistent contrails are formed in ice-saturated stratospheric layers. Crossing shuttle flights at regular time spacings will create that effect in the sky quite normally in such an event. They have fine tuned their methods so that no more green and lavender clouds appear. “Green and lavender” clouds occur normally in nature according with changes in solar spectral insolation and ground-reflected light. I do not believe it is sinister. By creating cloud cover the effects of global warming are mitigated in the treated areas. Nice theory. For how long is this “mitigation”? Where are the figures? “Flight formations and obvious spray patterns” – are the consequence of airline business. I suspect that the major ingredient in these clouds is water. Every engineer since James Watt could have told you that. Some type of polymer or salt is essential to geometrically spread out. NO. The dispersion of a trail to TEN kilometers WIDE by ONE kilometer DEEP takes hours and involves the UPTAKE of up to TEN THOUSAND times MORE ICE from the saturated water vapor in the stratosphere. It is spread by the ROTATIONAL ENERGY of the aircraft’s WAVE VORTEX. It is an amazing sight to see square clouds and tire tracks in the sky. One glance at one of those “All air travel in a day in 60 seconds” videos would put you straight. 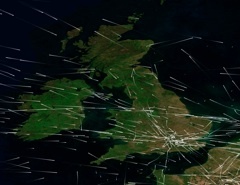 Aircraft routes cross EVERYWHERE! The conspiracy buffs think they have this pegged but I think there is a more rational explanation. Global warming is far worse than even Al Gore is stating. I cannot agree. When I look at the evidence I see nothing that leads in THAT direction. To think that the military and pharmaceutical companies have conspired to poison us is just to far out there for me to swallow. That appears to be D-I-Y hypocrisy. Your bag. Hence the massive contrail imagery on all forms of advertising. It’s massive neither in the skies as a whole, nor in advertising imagery. You searched it out… No? It is just acclimatizing us to what we see every day. Thank you for the sight. It’s banally normal. It’s physics. Go get yourself INSIGHT. You’re right. Contrails aren’t new. People are not confusing contrails.People know the difference between the benign water vapor contrail that diminishes quickly and the denser and more persistent whitish smoky contrail that lingers and expands over a period of an hour or more.The incorporation of artificial particulate matter allows the latter type to hang in the sky for long periods.People can even spot artificial cloud cover when they step out their back door,especially when they know that the humidity level is too low for real clouds to occur. How do you know they’re initially benign? and the denser and more persistent whitish smoky contrail that lingers and expands over a period of an hour or more. That’s not exactly what it does. In the saturated air of a humid stratospheric layer it cannot “diminish” for it cannot sublime into water vapor in the at all, in fact it puts on weight as it falls until it reaches the troposphere where it evaporates. And your reason for writing that was what? The only “particulate matter” is ICE CRYSTALS, with TRACES of SOOT PARTICLES and ACID MOLECULES. NOTHING “hangs in the sky” for long periods. Solid material objects (like ice crystals) have WEIGHT and FALL. Slowly, in barely saturated air, but speeding their downward fall the more humid and saturated the ambient air is. People can even spot artificial cloud cover when they step out their back door, especially when they know that the humidity level is too low for real clouds to occur. That PLAINLY DEMONSTRATES your failure to understand what you are talking about. Firstly, the reason why you can’t tell one trail from another is that THEY ARE ALL ICE CLOUDS just as CIRRUS clouds are ice clouds. Secondly these trails are NOT being made in YOUR weather. They are made five to eight miles up in a part of the atmosphere called the STRATOSPHERE, where the sky runs by a different set of rules. It is bitterly cold at its BASE (-40 or colder still) and gets WARMER with increasing altitude. The BASE of the stratosphere is just ABOVE the TOP of the ANVIL of a large cumulonimbus cloud. That’s the only time its easy to spot, although you sometimes see a thin mist of cirrus there. Also, the “afternoon white-out” sometimes caused by many persistent contrails joining up is up there, at the BASE of the stratosphere, for beneath it the falling ice crystals WILL be evaporating into what you know to be “your weather”. What do you say to that? You’ve been WRONG every time… Why do you think that is? It’s funny how much disinformation is out there on this subject. The bottom line is: the government HAS a military weapon called “Chemtrails” (ref- H.R. 2977), and the Geo-engineers have already admitted that this IS happening, and they also admit that it’s Aluminum they are spraying, and casually admit that they haven’t done any studies of it’s effect on the human body. You can no longer ignore or dispute the FACTS! Donny, you have repeated this same post on several topics. Stupid, Donny is trolling. Which makes him a troll. God I love my name…it allows for so much retrospection. Call Kucinich’s office and ask him what he meant by H.R. 2977 since he is the author. His office will tell you that they mentioned every possible type of weapons system, real or imagined, that they could think of just so it would be all inclusive. That way, no one could invent a weapon later that might be not covered by the bill. So yes, “chemtrails” are explicitly described in the bill. However, we may note that many other “weapons” listed in this section are hypothetical at best. It may well be possible that Rep. Kucinich has no specific knowledge of chemtrails, but has merely included them in an effort to create an umbrella bill which covers all conceivable types of weapons. Moonbow learned of this today when I called Congressman Kucinich’s office in Ohio and asked for a definition of the word “chemtrails” as it appears in HR 2977 bill that was submitted to Congress on October 2, 2001. I was told that I was the first person to call about the wording of that bill and also the first person to ask about the word “chemtrails” in it. Apparently, the Congressman’s office is not aware that Chemtrails are a large phenomena on the internet and it appeared that no one in his office knew anything about what a “chemtrail” actually was! They were apparently equally not aware that HR 2977 has become the subject of controversy in that it lists “chemtrails” along side other military “space weapons” technology (see bill listed here). Kucinich’s office asked for Moonbow’s URL so that they could become more familiar with what “chemtrails” are all about. Wouldn’t it be easier to just have someone test the inside area of the planes/jets that emit these contrails? Which would prove or disprove any “conspiracy theory” that alarmists speculate on? But, that would prove to be too easy and the paranoid people would still not believe it even if they tested it themselves because…..they would say the government knew they were coming to test it and cleared away any agents present. But, if that is the case, these people who feel the gov. is still involved, watching their every move, have them tapped must be a functional paranoid schizophrenic! I’m pretty sure the gov. does not have the time nor would they ever just monitor “Joe schmo” (made up fictional name, used as an example) because they can, it would use up too much time and resources. Get real. These people who feel evil motives by the government are probably psychologically ill and need to be evaluated for paranoid schizophrenia at most if not then screened for delusions/hallucinations and what could be causing it, maybe it really is the government putting unwanted meds in their drinking water or tapped their tooth fillings….No I shouldn’t make light of a real psychological/physical/hormonal illness, that actually, can somewhat be controlled with the proper treatment and medication. How sad for these people to be consumed with the fear that the government is trying to poison it’s own people. If you think about it, and I mentioned this many times here before, the inside of ANY aircraft should show evidence of what is or isn;t being spryayed since all aircraft use outside air at altitude to pressurize the cabins. And there have been studies done to see just exactly airline passengers are breathing. I believe one studied revealed an alarming level of some compound found in jet engine oil that was present because there was a leaking seal on one of the engines. Yes – Mobil Jet II getting into the aircon is pretty nasty – we had that with BAe-146’s in the early 90’s – in their case it was leaking from the APU’s into he aircon ducts, and then being heated by the hot air from hte engine. Other a/c have different problems. We went as far as replacing hte APU’s with a new modl, which fixed it at least until I left the airline – although I hear 146’s still have problems. Yes. Steve Svensson, the guy in the video, got a microfiche copy of that chemistry textbook, and is promoting it as some kind of chemtrail manual. He considers it ver suspicious that the air force academy should teach chemistry. Apparently Silver Iodide is mentioned, which he finds very suspicious. 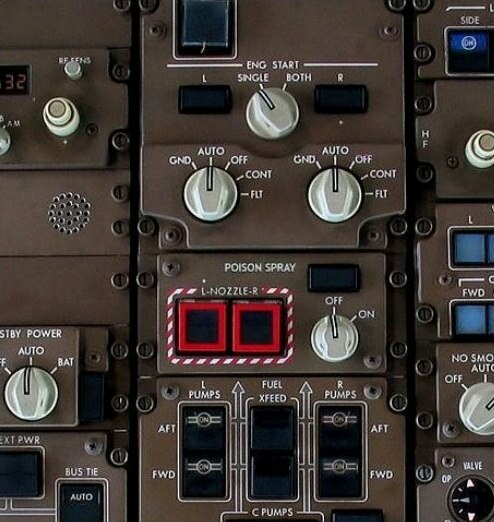 That’s the Fuel Jettison panel on a 767-300, relabeled for humorous effect. Well there’s a few on that forum are convinced it’s real. Why are the aircraft white with no decals at all? I have photographed them ~ white aircraft not belonging to an airline or even air force? Today nice sunny day, blue skies and the sky here is crisscrossed with chem-trails. Why do these planes sometimes fly side by side? I personally wear a painters mask when I see a lot of chem-trail activity. More an more people are feeling lethargic for no reason. Something is very fishy. I’ve been reading through all the comments here and, unfortunately, I’m still not convinced that these trails are common. I’m 27 years old and I know how plane contrails looked like when I was a kid. I KNOW that I’ve never seen anything like this before. I’m not a scientist, unfortunately, but no one can tell me that this is something usual! Come on, people, don’t make fools out of us! I’m from Serbia, a little European country, and for the last 4, 5 years our sky is covered with thick, white trails going criss-cross when the weather is nice. I can only imagine how does it look in USA. Even my 65 year old father noticed something strange about this! I’m reading everything I can find on this topic all around the web, hoping that something will finally ease my conscience… I don’t know what’s happening and why, but something is different. Please, PLEASE don’t tell me I’m wrong. Just look at the sky! Vaskezz, how do you then account for all the people who DO remember trails just like these? Air traffic has greatly increased over the last 30 years. Serbia gets a lot of flyover traffic.